Have you filed your taxes yet? If you have, good for you - I certainly haven't! If you're like me, don't worry quite yet, you have two extra days this year to get it in! Typically, Tax Day is on April 15 but since that is a Sunday this year and April 16 is an observed holiday (Emancipation Day), the deadline for personal income tax returns has been moved to April 17. But even with the two-day extension, you shouldn't procrastinate on filing, printing and sending your tax returns - problems almost always arise that can delay you. It is easier to proofread a physical copy. Personally speaking, printed copies are easier to read and correct than their online counterparts. You can make marks, highlight and write the correct information where necessary. This way, you know what's wrong, where it's wrong and (usually) what should go there. IRS audits have been on the rise in the past decade - simple reviewing and proofreading can save you time, money and worry. Track the mailing status of your tax return, and know that it was officially received. Whether it's the worry of losing my Internet connection at the very moment I electronically send my return to the IRS, and losing everything, or that some worker might accidentally delete it from the network with a single click, e-filing seems very flimsy to me. It might be a bit more expensive to send it via mail, but the security of knowing where my returns are and when they reach the final destination is worth it in the end. Don't know the address to send your federal tax return to? 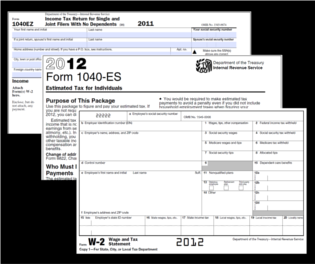 Check out Where to File Paper Tax Returns on the IRS website. If you choose to mail your tax return, it only needs to be postmarked by April 17. It is a common misconception that your filings have to be at the correct office BY April 17, 11:59PM. However, you only need to have the envelope postmarked by that date in order to qualify for being on-time. Just make sure you know what time your local post office closes! Printing one copy will prompt you to print a second copy for your records. As we fall into the Digital Age, it becomes easier and easier to just click SAVE for a document and feel safe in that saved copy. However, tragedy can strike and computer hard drives may be erased or lost forever (knock on wood, of course). It is important to keep records of your past tax returns, should anything go amiss or you need the information for the coming years. When you print one copy of your return, it is simple to print one more and file it away in a secure place. If you don't have a copy of last year's returns, here is how you can get it. Most tax return filing software offer detailed instructions on filing a paper return by mail. The resource is already at hand, and the benefits can be greater than e-filing. Use what you have. If you're now considering printing your tax return, make sure to check you have enough ink, toner and paper for your printer - or that your printer works at all! Doing a test print definitely helps clear your printer, and if there is nothing wrong, you have an extra copy already. It's important that everything is printed clear and legible; one wrong smudge and you may end up owing the IRS more. If all else fails, you can always file for a tax extension. They are due on the same day as tax returns (April 17th) and give you an extra six months to file your actual return.